It's a busy weekend in the land of sports...and we're not talking the golf tournament at Quail Hollow, hockey and basketball playoffs, baseball games, or the Kentucky Derby that have sports aficionados astir. But we are talking about the sports that get you in on the action rather than simply watching the plays unfold. Spring is in full swing--even the weather is cooperating a bit this year--and the event calendar knows it. This weekend not only marks the start of a new month (where have the last four months gone?) but a hotbed of runs, triathlons and other endurance-related events. While it may be too late to actually participate in some of these--some filled months ago while others, like the marathons, might provide a bit of a challenge to just run 26.2 with preparation--you might have a friend or two racing this weekend and maybe you want to track their progress (I have at least four). These are just some of the events to entertain you over the weekend, maybe even get you active, too. World Fitness Day. Thanks goes out to the Fit Bottomed Girls for tipping me off to this inaugural fitness frenzy on May 1. I had spotted posters around my gym noting National Pilates Day--held on the first Saturday in May--but honestly didn't think it was possible to have two fitness-focused celebrations on the same day. While anyone can celebrate fitness, the true World Fitness Day celebration--the one making all the news, that is--will be in Atlanta and will see some of fitness' favorites like Jane Fonda, Richard Simmons and Billy Blanks. I guess this also means I have to make sure I don't skip my Saturday workout. 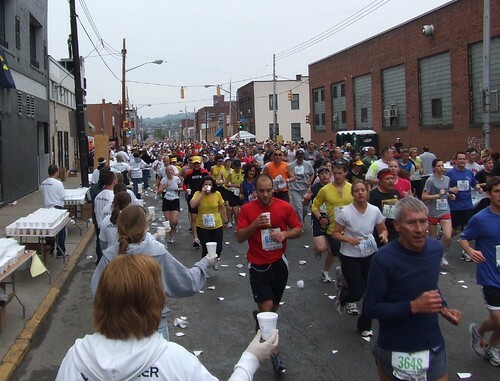 Pittsburgh Marathon and Half Marathon. I've had this May 2 race on my radar since snow blanketed the ground. Not because I'd be running it but because a friend chose it as her first marathon, then shortly after that another friend mentioned running the half. Let's just say I'm uber-excited, although nearly as nervous as they are about the iffy weather (rain, storms, heat) that's supposed to Steel City just in time to affect runners. I'll be following them via the TweetMyTime feature come Sunday morning. Ironman St. George. I was psyched with the World Triathlon Corporation announced this latest addition to the 140.6 races in North America last year, but not totally convinced that I wanted to test my legs on a new and unfamiliar course (just me and my nerves). The inaugural race that brings Ironman back to Utah is set for Saturday, May 1, and promises to bring a bevy of pro triathletes to the course. The only problem is that the weather leaves something to be desired--Ironman aficionados reported rumors of the water temperature being in the 50s and the air temp not being much higher. Illinois Marathon and Wisconsin Marathon, plus half marathons at each. Around this neck of the woods, this weekend leaves runners with the option to drive south to Champaign or north to Kenosha, Wis., if they're looking to cover 13.1 or 26.2 miles. Both races are in their second years but if you want to get technical, Wisconsin had this weekend first and Illinois only hopped aboard this year after holding its inaugural race in early April (before Boston) last year. I'm sure the weather, and our super-slow start to spring in 2009, had something to do with the change. Now this year, runners have to decide how badly they want a cheese wedge-shaped medal over finishing on the 50-yard line of Memorial Stadium at the University of Illinois. Cincinnati Flying Pig Marathon. The next stop on the RW Elite tour for 2010 comes just two weeks after its showdown in Boston. This Sunday marathon is the first race of the Runner's World Challenge that made its debut at the Richmond Marathon in November, and has been perennially known as a fast favorite. Tough Mudder. The New York Times thought this race was worthy enough to include in its pages earlier this week, and I've spied the Facebook ads on more than one occasion. The first of the Tough Mudder series goes down at Bear Creek Mountain Resort near Allentown, Pa., on Sunday, offering a adventure race-type challenge for athletes looking to have fun without focusing so much on the clock. That's just the tip of the iceberg. I made the mistake of checking the calendar at marathonguide.com--one of my favorite race websites and resources--and saw several other races on tap for the weekend. Eugene and New Jersey were two others that stood out for example. What are you going to do this weekend? Photo grabbed from runJMrun at flickr.